Digby - Blackberry’s best friend? I've been using a handy new utility called "Digby" that lets me find gift ideas, send gifts to people, and that sort of thing - right from my Blackberry. 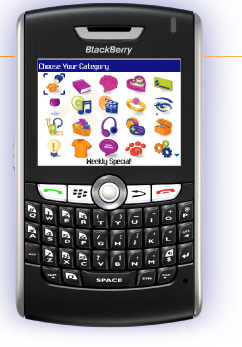 Digby is a Blackberry-only application that provides a great front-end for a bunch of merchants. As you can see, they use a dog's paw as their logo, so I think you're supposed to think of Digby as a faithful companion that fetches things for you. You start by browsing for categories (wine, chocolates, gift baskets, romantic gifts, electronics, music, etc.) and then you're presented with selections from their partner merchants.You can get descriptions, pictures (in some cases), and prices for a wide variety of gifts and place the orders in a quick, easy process. You can see a demo of Digby in action, or get an overview of features at the Digby demo page. I'm not sure how the service will expand over time, but its current selections seem like they're most useful for people who send gifts professionally - to clients, prospects, and business associates. And, for those occasions when you need to make a deposit in your spouse or special friend's emotional bank account, there are categories in Digby which are fit for that purpose (gift ideas for her, gifts for the man who has everything, gifts for two...). You can check out the app for free (you don't even have to sign up to browse the categories and merchants) by pointing you Blackberry at http://www.digby.com/download - it's quick and easy to install and give it a spin. Who knows - once you take Digby home, you just may want to keep him.